The gray fox (Urocyon cinereoargenteus) is a family Canidae carnivore that inhabits areas all throughout North America and Central America, from the southern portions of Canada to the United States, Nicaragua, Honduras, Costa Rica, Mexico and various other nations. Although numbers of gray foxes are consistent throughout their range, as with most other animal species, they have some risk factors. Although gray foxes are called gray foxes, mature specimens are actually a blend of several different colors. These colors include gray, black, red and white, indicates Animal Diversity Web of the University of Michigan. The moderately-sized creatures are usually between 31 and 44 inches in body length, notes the Smithsonian National Museum of Natural History. They usually weigh from 6 to 15 pounds. Both meat and plant matter are part of their diet, with diverse key elements including cotton rats, lizards, rotting animal remains, woodrats, corn, fruit, acorns, butterflies, grasshoppers, eggs and mice. Female and male gray foxes alike typically attain sexual maturity at roughly 10 months in age. In terms of population size, gray foxes are going strong, according to the 2008 evaluation from the IUCN Red List of Threatened Species. The organization, as a result, placed the skilled climbers into the "least concern" category. The species is in no imminent danger of dying out. For the continued survival and success of the gray fox as a species, habitat issues may become problematic down the ine. Gray foxes live in many areas that have dense human populations, which may have a negative effect on them. With swift development of human settlements, gray foxes may eventually face the menace of being driven out of their natural habitats, whether farming sites, woodlands, shrub land, pine forests or anywhere else. Gray foxes are also occasional hunting targets, mostly for use of their fur, but also for unlawful pet trade purposes. Although gray foxes are hunted, it isn't as common as in some other types of foxes, as the grade of their coats is perceived to be somewhat inferior in quality. Several thousand gray foxes are caught for fur acquisition each year, notes the Minnesota Department of Natural Resources. 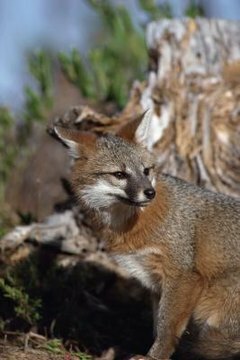 Non-human predators are also a risk factor for gray foxes. Some animals that routinely prey on these foxes include bobcats, coyotes, dogs, cougars, great horned owls and golden eagles.